Remember Steve and Taylor, the two guys from Massachusetts who were biking across the US and who slept on our couch a while back? Well, they made it to California, having biked over 5,000 miles. 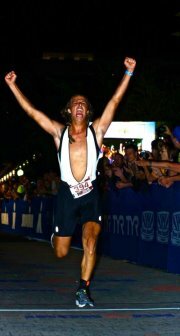 And then they did what any sane person would do: they completed the St. George Iron Man. For those of you who don’t know, an Iron Man competition is where you swim 2.4 miles, bike 112 miles, and then run 26.2 miles. Whaaaaat! Taylor finished in 16 hours and 50 minutes, while Steve came in at 13 hours and 26 minutes. Wow!! That’s Taylor crossing the finish line. These guys are champions. Check out their blog for their whole story! Happy Tuesday, guys!